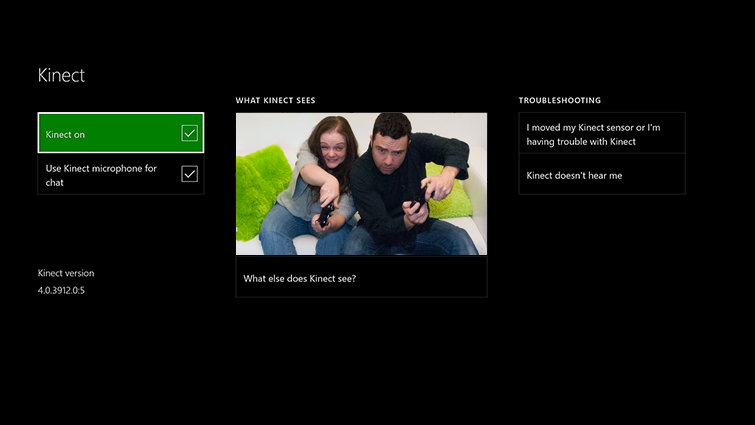 This article describes how to troubleshoot issues with your Kinect sensor. For example, you may experience an issue where the Kinect sensor does not see you or does not interpret your body actions correctly. Whether you are trying to play a Kinect game, using gestures to navigate the home screen or signing in using Kinect, make sure that the Kinect camera can see you to ensure a great experience. Typically, high-definition cameras need a certain amount of light in order to get the best exposure. Make sure that your play space is well-lit, but avoid direct sunlight on users and the camera. Make sure that Kinect is plugged in and on. The Xbox logo on the Kinect lights up when the sensor is on. 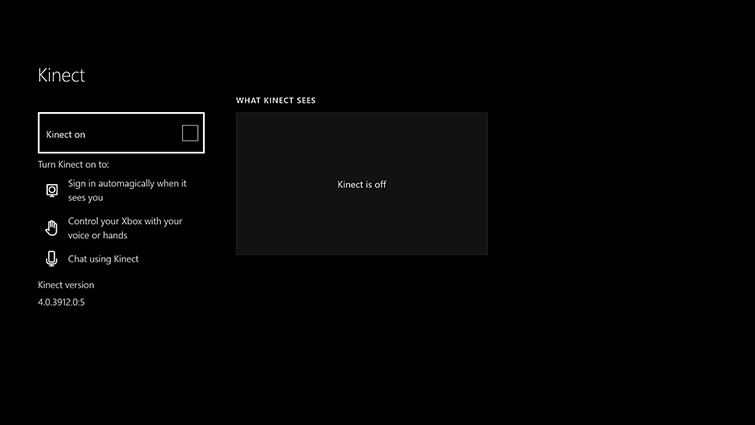 If your sensor won't turn on, see Your Xbox One Kinect Sensor won't turn on. If your Kinect sensor is plugged into your console but you see "Kinect is unplugged" on the home screen, see Kinect sensor isn't recognised by your Xbox One console. Press the Menu button on your controller, and then select Settings. Just plug your sensor in if necessary, and then select Kinect on. 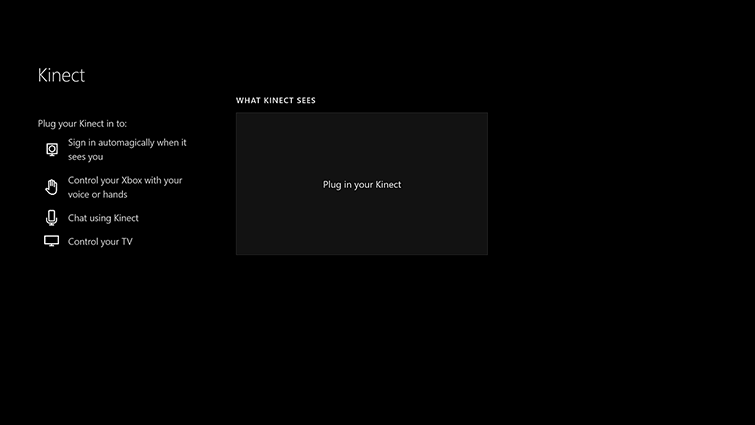 Press the Menu button on the controller, select Settings, and then select Kinect. For information about how to adjust the angle of the Kinect sensor, see Adjust the angle of your Kinect sensor. If you have problems while in a game, refer to the tutorial for the game, and then adjust the Kinect sensor while in the game. 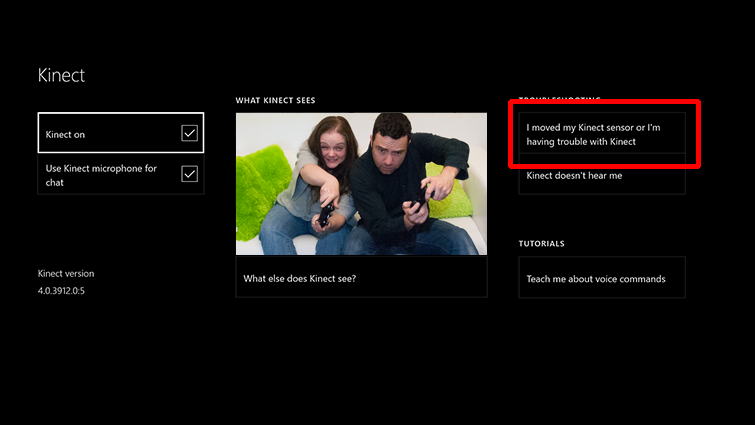 If you continue to experience the problem, request a Kinect sensor repair at the Xbox Online Service Centre. Console registration is required to replace the sensor.